HEINEKEN Ireland is the first drinks company in Ireland to achieve the Business Working Responsibly mark from Business in the Community in recognition of its responsible and sustainable business practices. The Mark, developed by Business in the Community Ireland, and audited by the NSAI, is based on ISO 26000 and is the only independently audited standard for CSR and Sustainability in Ireland. 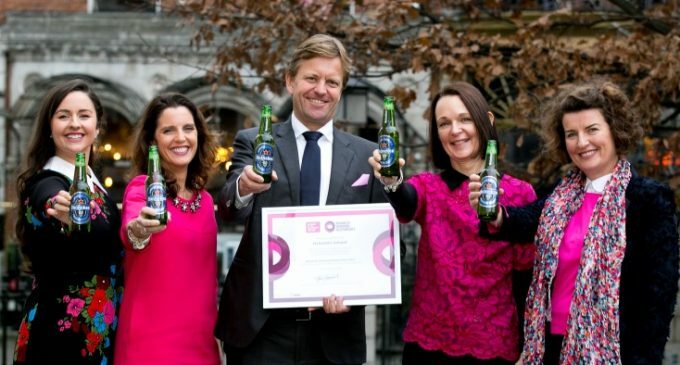 HEINEKEN Ireland’s achievement of the Mark comes towards the end of a landmark year in sustainability for the company; a year in which the company was also shortlisted for two Chambers Ireland CSR awards. Achieving its target of a 20% CO2 reduction within its distribution network three years ahead of its 2020 schedule. Continued investment in the local community spending over €100m annually in the Irish economy and working with 1,000 Irish suppliers and service providers. A commitment to charitable causes involving a donation of €450,000 to 50 local causes as part of its ‘Growing with our Communities’ initiative. HEINEKEN Ireland has continued its market leading commitment to responsible consumption developing the growing low and no alcohol market in Ireland with the launch of its innovative non-alcoholic beer Heineken® 0.0 and its 3% beer Heineken® Light. Committing to Business in the Community Ireland’s Low Carbon Pledge. Maarten Schuurman, HEINEKEN Ireland Managing Director, and the HEINEKEN Ireland CSR and Corporate Affairs Team collect Business in the Community’s Business Working Responsibly mark.